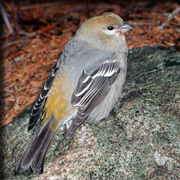 This is not a comprehensive list of bird species for the Adirondack Park but represents occurrence on the Huntington Wildlife Forest and immediate vicinity. Deisch, M. S., R. W. Sage, Jr. and P.F. Steblein. 1987. Checklist of vertebrate species found on Huntington Wildlife Forest and in the immediate vicinity. Adirondack Ecological Center, Special Project No. 1. 20pp. Peterson, R.T. 1980. A field guide to the birds of eastern and central North America. Houghton Mifflin Co., Boston, MA. 384pp.